Admittedly, this post is a few weeks late (insert face palm emoji). April has been a crazy month (more on that very, very soon, I promise!) But seeing Camper snoozing away on the couch makes everything feel a lot more calm. Making: salads for lunch. It's so easy to eat salads during the summer, but in the cold and rain it gets a little tough. I've been researching recipes to spruce them up a bit (I'll have a post on one of my favorites very soon). Watching: Game of Thrones. Hayden hasn't seen it, and we're catching up before the new season starts this summer. ALL THE FEELS. Doing: packing (that's a poor sentence). My lease is up at the end of May so we're moving! Thinking: about spring clothing (still). I surprisingly haven't really bought much (my bank account thanks me). I went through my closet and honestly, I'm good to go. Visiting: with my girlfriends via massive text group before our Florida trip in a week and a half. Wearing: the same North Face sweatshirt every single night because RAIN and COLD. Spending: a lot of money at IKEA for things we need for the move. And legit forgetting the one thing I went there for in the first place every.single.time. Shopping: for bedside tables. Wayfair has some great options at various price points (thank goodness). Eating: smoothies almost every day. My current favorite is a peanut butter, rolled oats and honey smoothie. Recipe coming soon (and corresponding photo that caused me to intentionally put rolled oats all over the floor). Drinking: rose! Rose season is here and it's my favorite. Missing: Alaska (yes, still). I'm writing a post about our entire trip and it's SO hard to do! I have so much to say and I can't seem to find the words. Planning: our summer calendar, still. The wedding count is currently at 13. Reading: This Is Where You Belong: The Art and Science of Loving the Place You Live by Melody Warnick. Still. It's been a busy few weeks. The plan is to finish it on my girl's trip to Florida. Wanting: my weather app to NOT predict cold and rain anymore. Help. Enjoying: fun walks and little trips with Camper. We went to a donut shop and coffee house earlier this week and he enjoyed both (his mama did too). 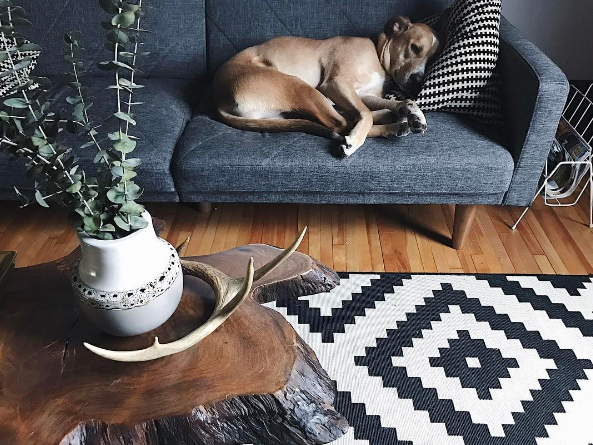 Pinning: decorating and DIY everything. Pondering: what Camp does when I'm gone at work every day. I'm seriously thinking about investing in a doggie camera. Any thoughts? Listening: to Father John Misty. His music feels equal parts springy/rainy/outdoorsy, and this time last year, my bff Kelsey and I saw him live in Minneapolis and met him afterwards. He's also playing in Minneapolis later this summer, so I'm vibing on his old music. Liking: all this green grass! Even if it comes with rain. Feeling: like some days there's not enough coffee in the entire world to wake me up. Noticing: that winter really is over, and we've got sunny spring and summer skies ahead. Going: to dog friendly places left and right. If you have any good recommendations, please let me know! Debating: not finishing this post and crawling back in to bed with Camp. He's the freaking cutest. Loving: the difference a good attitude makes. I remind myself of this often (because sometimes, your girl needs an attitude check). Marveling: at how good I can feel with a good night's sleep.